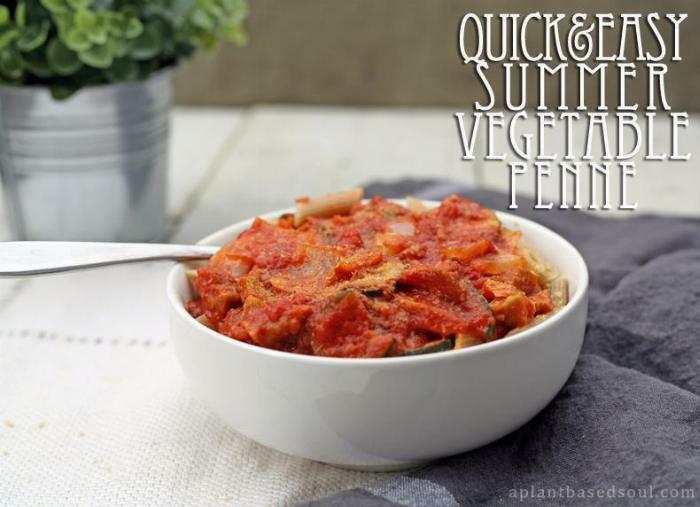 Harvest those summer veggies and turn them into this quick and delicious dinner! To make this meal gluten free, sub gluten free pasta. 1Begin by bringing a large pot of water to a boil. 2Prepare all vegetables by chopping into bite-size pieces. In a large pan, sauté the vegetables in 2 tbsp of olive oil over medium heat. After a few minutes, add the minced garlic. Continue to sauté until the vegetables are soft, about 5-7 minutes. 3When the water is boiling, add the pasta and cook according to package instructions. 4Add marinara sauce to the vegetable mixture and reduce heat to low. Simmer for 5 minutes. 5Drain the pasta and divide into four portions. Top with the vegetable and sauce mixture. Sprinkle with nutritional yeast if desired.